Christine Smith moved to Bellingham, Washington to attend Western Washington University in 1990, and stayed after she graduated because she loved the area. She is one of the founders of Northwest Navigation Co., Inc. which owns the David B. Alongside her role as chef, naturalist, mate, and part-time engineer onboard, she is vice president and runs the company’s office and it’s website. In the off-season she also operates a small gardening company, and is a founding member of the Northwest Wildlife Rehabilitation Center. Christine spends her spare time running the trails in the foothills outside of Bellingham. She lives with her husband Jeffrey and their two cats, Harriet and Oswald. We all have dreams but we do not all fulfill them. In "More Faster Backwards: Rebuilding David B" by Christine Smith, the readers take a journey with Christine and Jeffrey Smith as they capture their dream. From the moment the young couple stepped foot on board the David B they began to dream. It was as if the old ship had been waiting for them; she was worn and in rough condition. The David B was first launched in 1929. The antique engine was unusual with its reverse gear. The Smiths found her behind a breakwater on Lopez Island. It took over eight years of restoration to rebuild the old wooden ship. Christine, Jeffrey and their partner Aaron planned to use the ship as a small expedition cruise ship out of Juneau, Alaska. Things were not always smooth sailing. I am not giving anything away but only saying that the hard work paid off and the Smiths' success offers encouragement and hope to all readers to live their dreams. "More Faster Backwards" is an entertaining read. I found myself cheering the David B on. I wanted the Smiths to succeed. This book proves that with hard work, persistence, and determination you can achieve your dream. I was quickly drawn into this tale; I eagerly turned the pages not wanting to wait to see what new adventure the Smiths would face. Smith is a talented author. She paints a beautiful picture with words. The author shares photos in the back of the book. 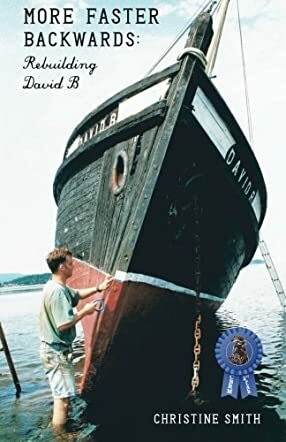 It is hard to believe that the David B looked that bad when they purchased her. The photos document the change as the work on the ship progressed. I have never been to Alaska but hope to make a trip there in 2014. I just may look up the Smiths and see the David B for myself.